If you are one of those people who work with fonts on regular basis, then choosing, comparing and analyzing fonts is a serious business for you. Font management is not always as easy as a walk on the cake. Font management issues like installing and uninstalling fonts, handling missing fonts, taking care of font conflicts always keep graphic designers and typographers on their toes. Also hundreds or thousands of fonts activated on the system can use up considerable amount of system resources which in turn reduces efficiency and productivity. Mac, Windows and Linux platforms have their own font management utilities, but these utilities are not sufficient in a specialized or professional environment. This is where professional font management tools come to the rescue. Below we have reviewed 25 free/commercial font managers for Mac, Windows and Linux. Which one do you use and why? Your favourite tool is missing? Let us know in the comments! Suitcase Fusion (Mac) and Suitcase (Win) are powerful, quick and clever font managers which have a simple and an intuitive user interface. While previous versions of Suitcase created a database of information about your fonts, the fonts remained in their original location. 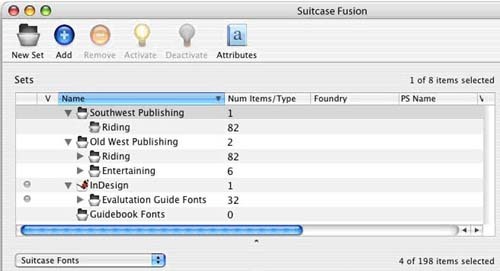 You still have this option in Suitcase Fusion but also have the option to collect your fonts in a structured and secure repository called the Font Vault. The Font Vault gives users much more control over their fonts, eliminating unnecessary font conflicts, duplicate font issues and providing easy access to your own library. Suitcase ensures you have the exact version of the font you need and prevents potential font wrecks (due to missing or substituted fonts. It also keeps fonts in one, secure location – easy to find and back-up. It also offers auto-activation: only the fonts you need are activated when you open a document and deactivated when you close. With both Suitcase Fusion and Suitcase for Windows you get FontDoctor. FontDoctor is a professional software tool that takes the work out of locating, diagnosing and repairing the most common font problems, so you can stay focused on the task at hand. Suitcase Fusion price starts at $99.95. Suitcase Fusion is for Mac and PC. Font Sense, the most advanced font matching technology available, that allows for a deep level of font analysis when identifying fonts for auto-activation using multiple criteria—font type, foundry, version, etc. What makes Linotype FontExplorer X really different, is the integration of an online store which lets you browse through fonts you are considering for purchasing. Hence, you can examine and compare fonts inside FontExplorer X’s online store as if they were installed on your system. The tool combines font management, font sorting, font shopping and font discovery in one user-friendly interface. 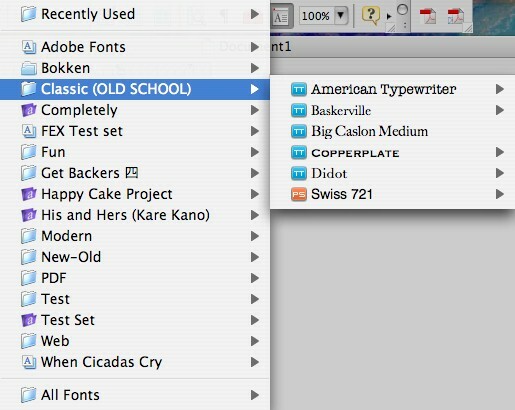 You can organize your fonts using a library, folders, tags and smart sets. That makes it easy to find all typefaces from a certain foundry, all italics or all fonts tagged with a certain keyword. Auto-activation enables you to you decide which applications may request fonts, and which may not. Plugins for popular DTP apps like Adobe InDesign, Adobe Illustrator and Quark XPress are available as well. You can examine the complete character set, inform yourself about the legal stuff or just see a few sample paragraphs to know what a font looks like in real-life context. Finally, you can enable/disable fonts, clear font caches, have a typeface family view, export font information as image/zip/disk image, missing font handling, document font scanner and Growl support. Supported languages are currently English and German. Linotype FontExplorer X is free. The <a Win-version is released as Beta (currently not available for download), the Mac-version is stable. A distinctive feature of MasterJuggler is its ability to store fonts anywhere and share them over a network. Hence, you can store your fonts in any folder on any drive and access them from removable media. With MasterJuggler you can organize fonts in custom sets to work with the fonts you need for your current tasks. You can also preview multiple fonts and sizes with full Unicode support and view a font’s entire Unicode glyph map to find the exact glyph you want. It is possible to create your own sample strings for display. You can customize the MasterJuggler toolbar to include the commands you use most often. The pricing starts at $89.95. 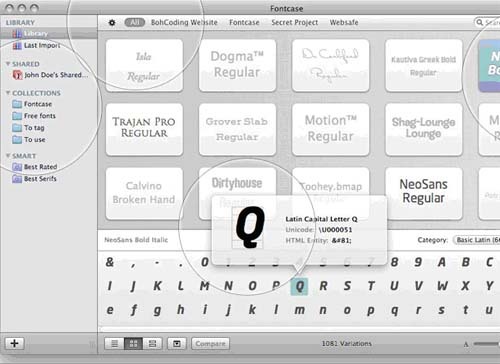 Font Safari includes support for multiple language keyboard shortcuts and string encodings. You can view all of the characters in the font and simulate the font in alternative encodings such as Mac Roman, Windows ANSI, Unicode and other common text encodings. You also can get keyboard shortcut information about all the characters of a specified font, view single characters or the whole glyph table. The pricing starts at $15.00. A trial version is available as well. If you are looking for a simple font previewing and testing tool without overwhelming advanced features, this tool is one of the first to be considered. Font Card is a haxie that modifies the Font menu and the font panel in Carbon and Cocoa applications. It can add an icon that displays the format of a font next to the font menu item or font panel list, display the font name in the font face, group fonts into submenus, and add third party font collections to the font menu and font panel. You can view third party font collections (Insider Software’s FontAgent Pro, LinoType’s FontExplorer X, and Extensis’ Suitcase Fusion). The pricing starts at US $17.00. A trial-version is available. Easy to configure as it comes in usual Preference Pane form, accessible through System Preferences. Font Pilot allows you to browse an entire folder of fonts that are not installed with a compact visual preview. While viewing the slideshow, you can simply click on the install button at any time to have that font permanently installed and activated. You can view and print a character map, view fonts by file or family, reveal fonts in the Finder, use Mac & PC key combos to produce characters and view invisible fonts. The pricing starts at $15.95. FontAgent Pro is supposed to be the world’s smartest font manager. Its Smart Activation function integrating in documents and determines precisely the fonts you need. The built-in MagicMatch agent ranks the fonts you may want to use in the future and suggests alternatives. All fonts are categorized automatically, so you can view and search fonts by category or create custom classes to search later. Finally, you can also use multiple criteria to filter the fonts you need: search by name, format, foundry, type, weight, proportion and angle is possible. It is also possible to automate your tasks and workflow with AppleScripts. What is really interesting is FontAgent’s ability to create separate font sets for projects and clients and store these fonts in separate libraries from your main fonts directory. The pricing starts at $ 99.95. A yet to come Font Manager, <a Fontcase looks exciting and enticing. The tool lets you create smart collections for your fonts and share your library using Bonjour. It also lets you view the full Udenicode table for each font in your library and view the html entities for all glyphs. You will have the power to view both installed and non-installed fonts by icons, lists or Preview lists. You can also tag your fonts and quickly filter or search your library to find exactly the fonts you are looking for. Currently you can only subscribe to a newsletter. Price: unknown. Typograf is one of the most detailed font managers out there. It displays all OpenType, TrueType, Type 1 fonts as well as printer fonts and raster or bitmap fonts on hard drives, DVD, CD, opticals, floppies or specific folders – including all subfolders. 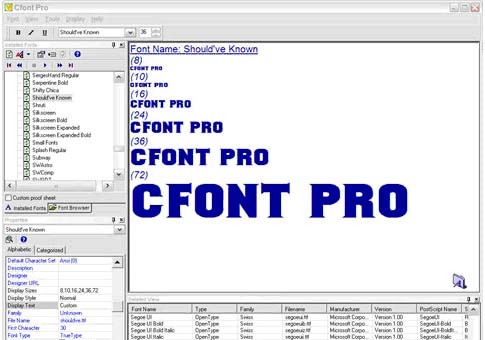 The tool can display a variety of font properties such as typeface classification by PANOSE system, IBM Font Classes or the Windows internal metric structure and kerning pairs. You can find related fonts based on typeface classifications and compare various fonts using tables that show major font features, file data, character width, number of kerning pairs. It makes Typography a useful tool for typographers. It also, of course, includes the standard font file management functions. The pricing starts at $35. A trial-version is available. 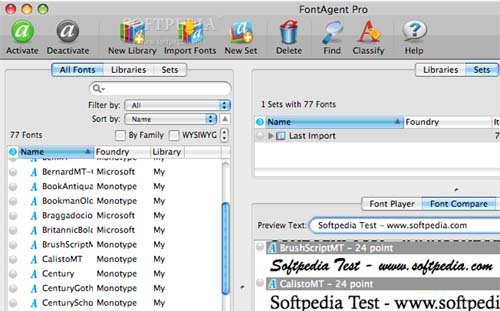 Apart from a usual suite of font management features, FontExpert 2007 offers you the ability to assign keywords, categories, ratings and captions in the tags view, print fonts, search for duplicates and corrupted fonts as well as examine your system for font errors. You can also export fonts to HTML (<a example) and add Open, Print and Install font custom menu commands to Windows Explorer context menu. FontExpert can create face sample images having custom width, height, color and file format (BMP, GIF, JPEG, TIFF, PNG). It can manage and print PostScript, TrueType, OpenType and raster fonts. It is easy to manage any typefaces that are shown in any view of the program. You can sort, filter, preview fonts, copy, move, delete font files, activate or deactivate fonts, add or link fonts to font groups (sets). The program can work with fonts located in the Windows Fonts and Psfonts folder (used by Adobe Type Manager), so you do not need to remove fonts from standard folders as some font managers require. The pricing starts at US $59.00. A trial-version is available for free download. If you are choosing a font for printed materials, you can use Advanced Font Viewer to print out the list and make your choice according to the real conditions of font usage. Designers who want to accurately compare patterns of several fonts that look similar, may create collection of fonts. An interesting feature of the tool is its ability to let users view previously uninstalled fonts and to install them. You can also print list with type specimens, remove fonts duplicates and fix registry fonts problems. The export to HTML is possible as well and you can also print out list of uninstalled fonts. The pricing starts at $49.95. A trial-version is available. 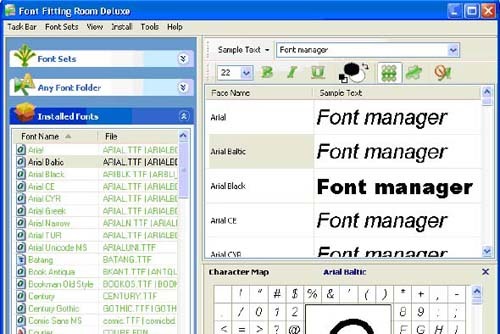 Opcion Font Viewer is a free open source font viewer written in Java. You can view installed and uninstalled fonts, mark fonts as favourite and preview fonts with a customizable sample/display text. Opcion is a very basic and simple font management tool. Its main advantage lies in the fact that it will work on all platforms. Hence, in case you need to look a font up, it may be the optimal quick’n’dirty solution. 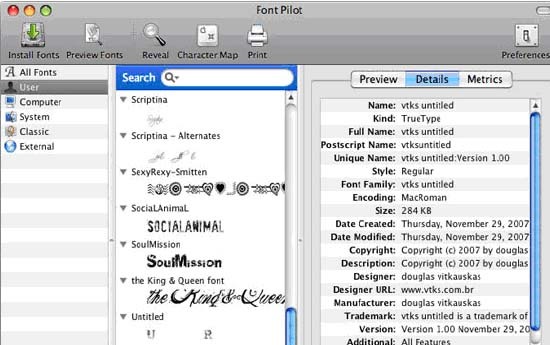 The tool provides a default view that allows you to view one font at a time, and a list view which allows you to view multiple fonts at a time. The favourites list can then be saved for future reference or used in finding out the file names of fonts you wish to install. 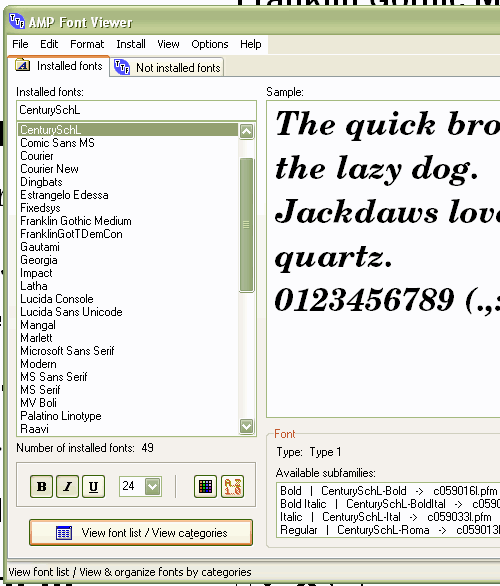 Opcion Font Viewer requires Java 1.4.0+ to run. The special FrenzySnap function enables you to establish “restore points” and re-install the fonts that were in your system on a specific date. The “DeFrenzy”-function removes all fonts except those originally shipped with Windows XP or Vista, or to a previous snapshot. You can specify a folder where all removed fonts will be stored. 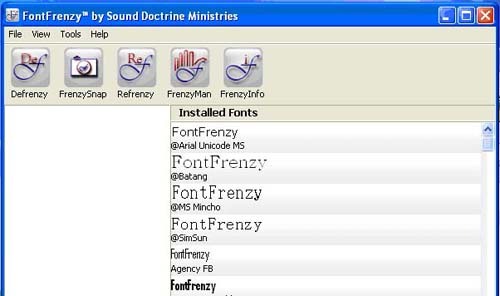 FontFrenzy is fully-functional freeware – with the nag screen easily removed after a quick registration. View all fonts from a specified folder. Font Xplorer has the ability to browse both installed and not installed fonts from the local disk. Some other prominent features include renaming font files to use a font’s full name with undo support (i.e. arialbi.ttf to Arial Bold Italic.ttf). A resizable character map that shows all a font’s scripts and allows you to zoom in on any character. You can even copy a symbol to the clipboard as a vector image or rich text. You can also filter fonts by character set so you only see symbol fonts. Font Xplorer does not support Adobe Type 1 fonts and OpenType fonts with PostScript outlines. It works with TrueType and OpenType fonts that have TrueType outlines. The application is freeware. MainType is an universal font management tool for both novice users and advanced graphic designers and typographers. 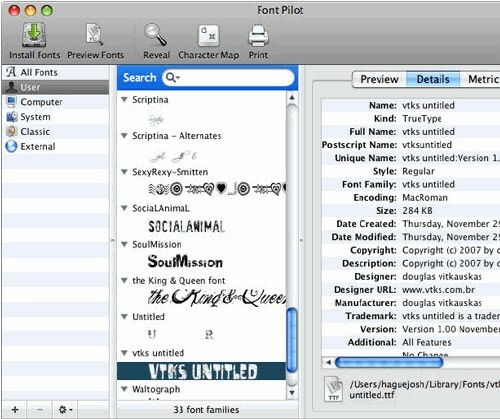 In order to find the right fonts for your needs, the software includes filter and sort functionality. The main information about the font, such as its properties, supported characters, font type etc. are displayed in a font information pane. A groups pane helps you quickly organize all your fonts. MainType is a drag’n’drop font manager that offers a straightforward and easy-to-use interface to help you find, preview, organize, install and print your fonts. The tool works with TrueType, OpenType, TrueType Collections, Postscript Type 1, vector and raster fonts. It also allows you to generate an HTML-based overview of any of your fonts, print reports and export the font information. The latest release includes the ability to type a preview text into the Font drop-down list, a character zoom popup window and more predefined font variables. The price starts at $49.00. Trial-versions are available for free download. The Font Thing is a legacy, a still very popular freeware program for managing TrueType fonts in Windows 95, Windows 98 and Windows NT 4.0. You can browse installed and uninstalled TrueType fonts, viewing sample text, individual characters, and detailed font information. Easy font-management functions let you install, uninstall, print, copy, or delete any number of fonts at once. You can also store your own notes with them, filter them according to type (serif, sans serif, and so on), and group them into collections for convenience. Users can rename font files to avoid conflicts, and load fonts temporarily for use without installing them. AMP Font Viewer 3.82 is a simple free font manager, which allows getting a quick overview of both installed and non installed fonts. You can install fonts from a folder into the system or temporarily (until the program is closed). There are also standard options for organizing fonts in categories and managing them. You can print a list of all or some of the installed fonts with an example of each font. The applicationhas a Scratchpad area for testing the look of any font. You can also group and categorize your favourite fonts. AMP Font Viewer is free and comes in a dual English/Spanish version. 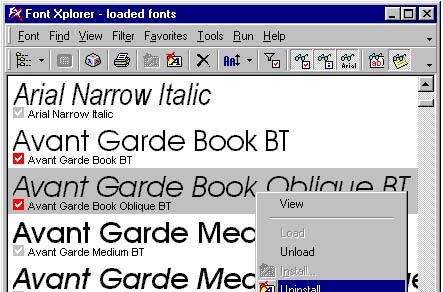 Just as Typograf, <a Cfontpro provides many details about the attributes of every installed or non-installed font. You can preview fonts from any folder, CD, disk, or network drive and export the proof sheet to HTML or Rich Text Format file (RTF). Using the advanced character map and a character magnifier you can see exactly what any font character looks like. You can also zoom in and out and look at any part against a grid. Another useful feature of the Cfontpro is the Font Packager which enables you to package any number of fonts into a single file for ease of transport to another computer. The application is free. Pigfontviewer (Win / Mac / Linux) Pigfontviewer is a simple but elegant font viewer that allows you to preview all fonts in your fonts folder. 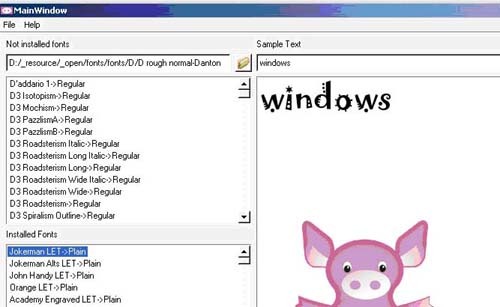 PigFontViewer also features the ability to display your fonts in any custom folder and install into them your fonts folder. A simple font management tool without advanced features. Font Fitting Room Deluxe (Win) An interesting feature of Font Fitting Room Deluxe is the ClearType Tuning. You can activate this function to switch the system smoothing mode, set ClearType contrast value, or change LCD striping order setting. You can preview the custom sample text with a font list without actually installing them. Unicode Range Character Map allows you to type sample sentence simultaneously containing any locale characters. For example, you can preview English and Korean characters in the same sample string. Price: $49.95. Fontmatrix (Linux, free) Fontmatrix is a general font management tool which is licensed under GPL. Standard features such as previewing fonts, installing and uninstalling them as well etc. are available. Good choice for Linux users. Font Showcase (Mac) A very handy utility if you’ve got too many fonts to remember just what each looks like, and also allows you to print out a catalog of your font collection. You no longer have to install the fonts before you can view and print them. It features basic viewing, font printing, font peek, slide show, FontStream, character view, and font panes. Font Wrangler (Win) Font Wrangler will allow you to install and remove TrueType fonts in batches; preview fonts before you install them; browse downloaded font files and view font copyright information. You can also print a ‘contact sheet’ of fonts so you’ll have a paper reference of what each font looks like and change your font names to make them more easily remembered and 1to resolve typeface name conflicts. Price: $24.99. A trial-version is available.